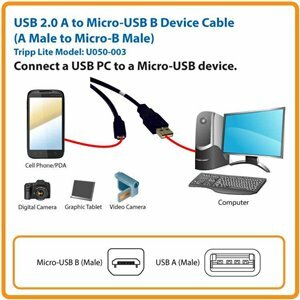 Micro-USB is the next generation of USB connector that will be found on Cell Phones, PDAs, USB On-the-Go (OTG) devices, Digital Cameras, and more. Smaller and more durable (10,000 insertion cycles) than the existing mini-B connectors, the Micro-USB will also handle Power transfers, as well as Data. The USB Implementers Forum (USB-IF) has designed the Micro-USB to eliminate many of the proprietary Mini connectors found on different manufacturers digital devices, and it will be the standard USB connection on phones from the major cell phone manufacturers. USB 2.0 rated cable handles 480Mbps data transfer rates. Don’t settle for inferior workmanship and performance! This Tripp Lite 3-ft. USB A to Micro-USB B 2.0 Gold Device Cable ensures maximum performance from USB 2.0 devices. Unlike cut-price cables, the U050-003 is manufactured to exacting specifications, using superior materials, to deliver full USB 2.0 performance for multimedia and other high-end applications. And we back our pledge of quality with a lifetime product warranty. This genuine Tripp Lite USB A to Micro-USB B 2.0 Gold Device Cable is the choice for superior performance, providing full USB 2.0 performance for multimedia and other high-end applications. Use it to connect high-speed USB 2.0 mobile devices such as smartphones, tablets, USB On-the-Go (OTG) devices and digital cameras. The U050-003 provides USB A (male) and Micro-USB B (male) connectors. It meets or exceeds USB 2.0 specifications and is backward compatible with older USB 1.1 devices. With its superior design and construction, the U050-003 is ideal for multimedia and other high-end applications that require fast, clear transmission, free of line noise and other interference. It supports faster data transfer rates (1.5 to 480 Mbps) for both low-speed and high-speed devices, including multimedia applications. The U050-003 is manufactured using top-quality materials to ensure maximum performance. Gold-plated connectors with gold-plated copper contacts provide superior connectivity. Premium double-shielding cables with tinned copper braid and aluminum Mylar foil minimize signal interference. Molded connectors and integral strain relief ensure durability and long cable life. A flexible PVC jacket makes the U050-003 easy to install, even in tight corners and other areas where space is restricted. The U050-003 is also compliant with RoHS standards, reflecting Tripp Lite’s commitment to environmental responsibility. For peace of mind, it comes backed by a lifetime warranty.